eBay’s new “Fill Your Cart With Color” campaign appears to have elevated the online commerce company to its greatest ad awareness since December 2014, according to YouGov BrandIndex, the only daily brand consumer perception research service. Currently, 22% of adult consumers 18 and over report seeing an advertisement for eBay in the past two weeks. Ad awareness was at 18% on June 5th, when the campaign launched, and had been as low as 14% in mid-May. This current ad awareness achievement is equal to the mark eBay reached when it launched its first global campaign, “Shop The World” (from agency 72ndandSunny), and at the same time redesigned its home page to be less cluttered. 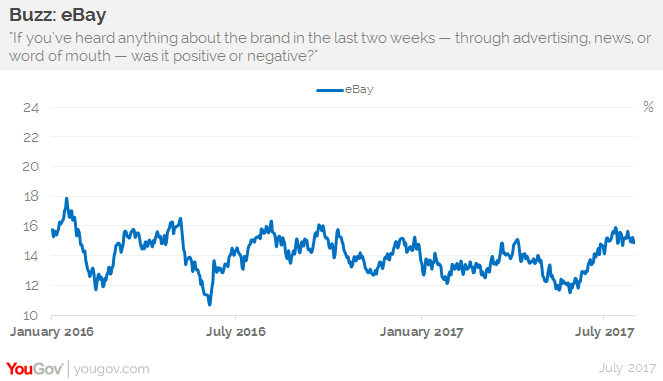 The next time eBay’s ad awareness came close to that number was two years later in November 2016 when the brand ran a TV-focused holiday campaign from Pereira & O’Dell. Additionally, the “Color” campaign seems to have brought eBay to its highest consumer perception levels of the year so far, as measured by YouGov BrandIndex’s Buzz score, which asks respondents "If you've heard anything about the brand in the last two weeks, through advertising, news or word of mouth, was it positive or negative?" A score can range from -100 to 100 with a zero score equaling a neutral position. 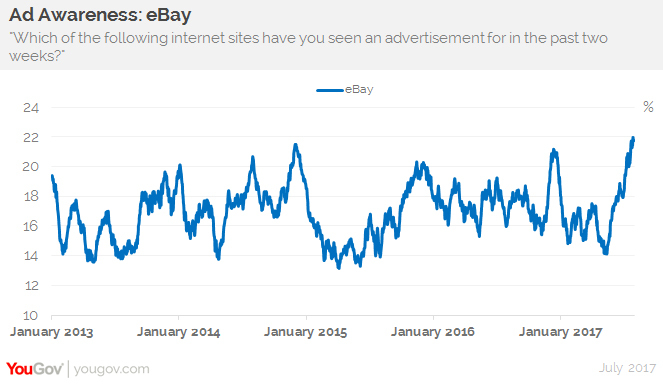 From June 1st through now, eBay’s Buzz score rose from 12 to 16, last reached in October 2016. About 80,000 consumers were interviewed over the time period. Margin of error +/- 3%.